Eating same healthy food sometimes seems to be boring. But we all want to gain benefit from eating healthy foods. To get benefits of good health grains like quinoa, couscous and oats we can mix them with vegetables and make Indian spicy tikkis. Add potato, beetroot, spinach and spices to these grains and make it more interesting to eat. 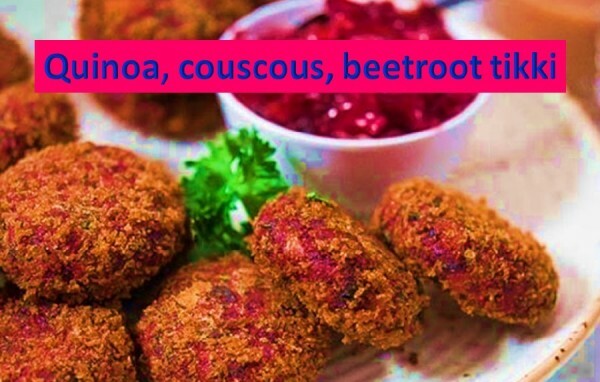 Try Quinoa, couscous, beetroot tikki. You can deep fry tikki or you can cook on tava. Cook quinoa and couscous. Quinoa can be cooked in pressure cooker, to cook couscous boil water, turn off the heat and add couscous. Keep it for 5 minutes and drain water. Now add all ingredients (except coriander) to potato and beetroot bowl and Mix well. Take 2 Tbsp of the mix and make round ball. Flatten the tikki ball in your palm to make tikki. Prepare flattened tikki and keep on a plate. Refrigerate flattened tikki for about 15 to 20 mins. *Heat oil in a frying pan on medium heat. Slowly release tikki into hot oil and fry. Continue frying both sides till it turns light brown and appears crispy on both sides. *If you are not a fan of fried food, alternatively place tikkis on tava and cook on medium heat by putting little oil. Cook on both sides till tikkis turn brown and crispy.